City Nursery provides childcare to all parents who live, work or study within the wider community. As well as a sensory room for children for small groups or just to spend some quiet time. We also have a children’s library for you to borrow books from. Here at City Nursery, we respect your child’s age stage and celebrate their development, and move through the Early Years Foundation Stage Curriculum (EYFS) as and when they are ready. Their Key Person will plan lots of fun activities for them, based on their individual needs. All staff are highly qualified and experienced and are supported by an Early Years professional who takes responsibility for leading and managing play, care and learning. Each child has a special Key Person who will complete observations and take photos of your child whilst they play. These will be put into their own profile that we call a Learning Journey. You will be able to look at these any time you want, and even add to them with pictures and notes from home! We value each family’s contribution, and so we always invite parents to come to our Parent’s Forum once a term. This is a great place for you to tell us what we can do to help you, including key speakers and specialist such as speech and language therapist or to listen to your ideas to improve our setting. During the school holidays we can take school children up to 7 years old. We plan lots of different activities during this time including arts and crafts and outings. The nursery is Ofsted inspected and received a judgement of Good at the last inspection in 2014. "Staff have skilful understanding of how children learn best. Consequently teaching is good and children are making good progress in their learning and development...Caring and sensitive staff provide a nurturing environment. This gives children a strong sense of belonging and promotes well being." To view the latest ofsted report, visit their website. Please feel free to call in for a visit or contact the nursery on 0114 260 2818 for further information. Leave the M1 at Junction 33 (Catcliffe) and head on the Parkway towards the city centre. At Park Square roundabout, enter the left-hand lane and take the third exit towards the train station. Keep in the left hand lane and continue to Granville Square (roundabout) and turn left onto Granville Road. Sheffield City College is on your right. 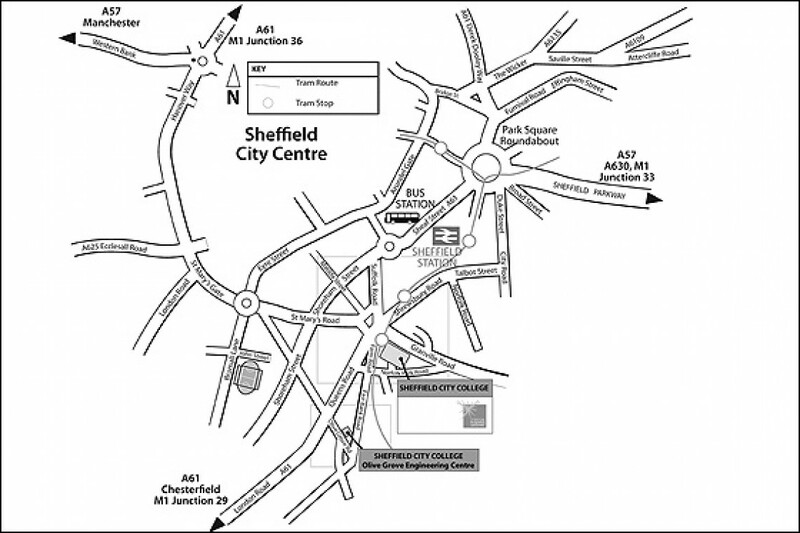 The nearest tram stop is: Granville Road/The Sheffield College. Trams heading to Halfway stop directly outside the College. Those heading to Malin Bridge or Middlewood or Meadowhall stop across the road. For live bus and tram updates click here or go to Travel South Yorkshire for timetables and fares, and the Supertram website for tram information. Bus: A variety of buses serve Sheffield City campus. Visit Traveline for timetable and journey options. Accessibility: see the Disabled Go website here.